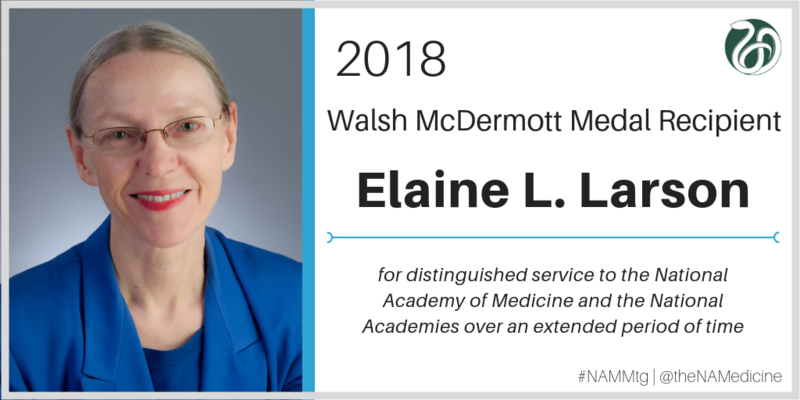 The Walsh McDermott Medal will be awarded to a member of the National Academy of Medicine in recognition of distinguished service to the NAM and to the National Academies of Sciences, Engineering, and Medicine over an extended period of time. Service to the NAM and the Academies might include leadership roles as an officer, councilor, committee chair, committee member, reviewer, board member, fundraiser, or other such contributions that have enhanced and furthered the mission of the NAM. Service on committees of the Academies and jointly sponsored activities such as the Committee on Human Rights; the Committee on Science, Engineering, and Public Policy; or the Government–University–Industry Research Roundtable shall be included as relevant contributions. Lynn R. Goldman, M.D., M.S., M.P.H. Dan G. Blazer, M.D., Ph.D., J.P.
Elena O. Nightingale, M.D., Ph.D.
Ada Sue Hinshaw, Ph.D., R.N.